I am always on the lookout for new recipes with eggs as eggs are our family favorite and egg recipes in my space would justify it :). 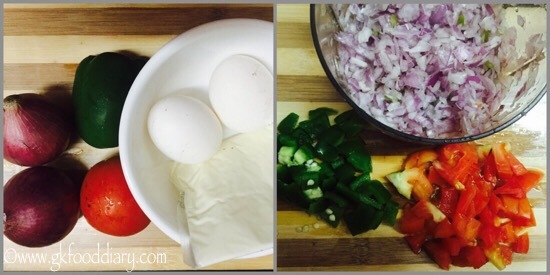 This pizza style egg omelette is very easy to prepare at home and requires minimal ingredients but tastes delicious. 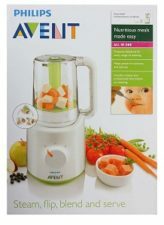 This is one good variety to try if you are bored of the usual omelette. 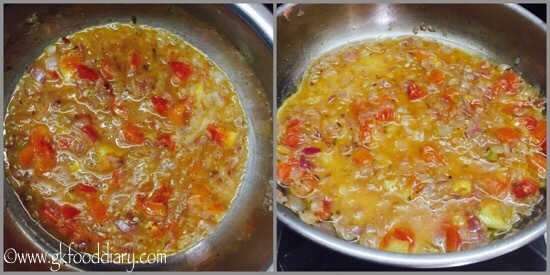 It tastes somewhat close to pizza so I named it pizza style omelette 🙂 By telling this I don’t claim this recipe tastes same like pizza:) But definitely it’s a easy and healthy choice to make at home when you are carving for pizza! 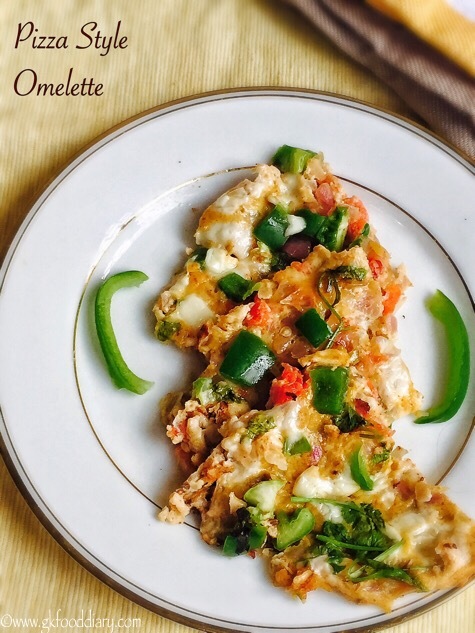 You can give this pizza style egg omelettes to your kids from 1 year as a breakfast/dinner or as a evening snack. 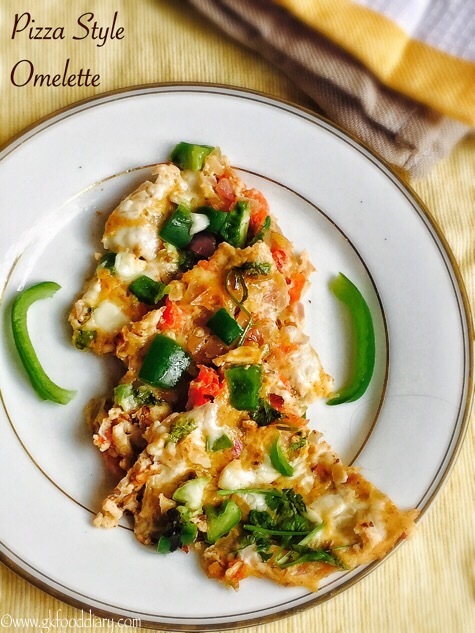 Let’s get on to check how to make this pizza style omelette for toddlers & kids. 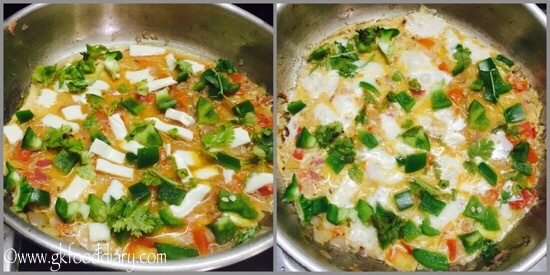 Pizza Style Omelette - Easy and yummy pizza style omelette with eggs.Tasty evening snack or breakfast/dinner for toddlers & kids. Keep all ingredients ready. Finely chop onions, tomatoes. Cut capsicum into cubes. Set aside. 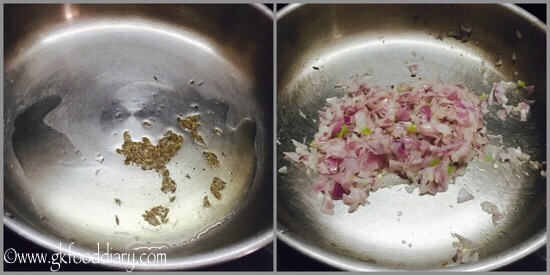 Heat a tsp of oil or butter in a pan, add cumin seeds. Let them splutter. Then add chopped onions and fry them until brown. Now add tomatoes. Saute it until tomatoes become mushy. Switch off the flame once done. Let it cool down for some time. Set aside. In a vessel, add eggs, red chilli powder, corainder powder, garam masala powder, turmeric powder, chat masala powder and required salt. Mix well. Now add the fried onion tomato mix to the same vessel and mix well. Heat a pan, spread the egg batter. Now arrange chopped capsicum, chopped coriander leaves and cut or grated cheese over it. Sprinkle oil or butter. Cook it covered on one side for five minutes and remove from the pan once the eggs are cooked and omelette is done. Cut and serve in pizza style! 1. Keep all ingredients ready. Finely chop onions, tomatoes. Cut capsicum into cubes. Set aside. 2. Heat a tsp of oil or butter in a pan, add cumin seeds. Let them splutter. Then add chopped onions and fry them until brown. 3. Now add tomatoes. Saute it until tomatoes become mushy. Switch off the flame once done. Let it cool down for some time. Set aside. 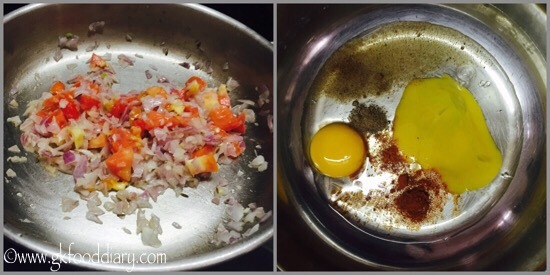 In a vessel, add eggs, red chilli powder, coriander powder, garam masala powder, turmeric powder, chat masala powder and required salt. Mix well. 4. Now add the fried onion tomato mix to the same vessel and mix well. Heat a pan, spread the egg batter. 5. Now arrange chopped capsicum, chopped coriander leaves and cut or grated cheese over it. Sprinkle oil or butter. Cook it covered on one side for five minutes and remove from the pan once the eggs are cooked and omelette is done. Cut and serve in pizza style! 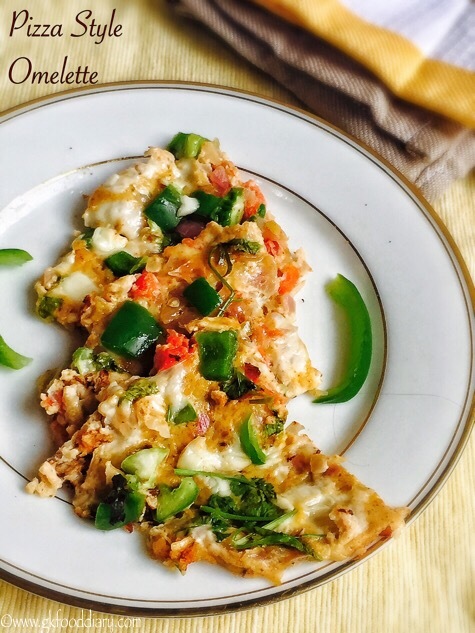 The tasty pizza style egg omelette is ready! Non stick pan works best for this omelette. 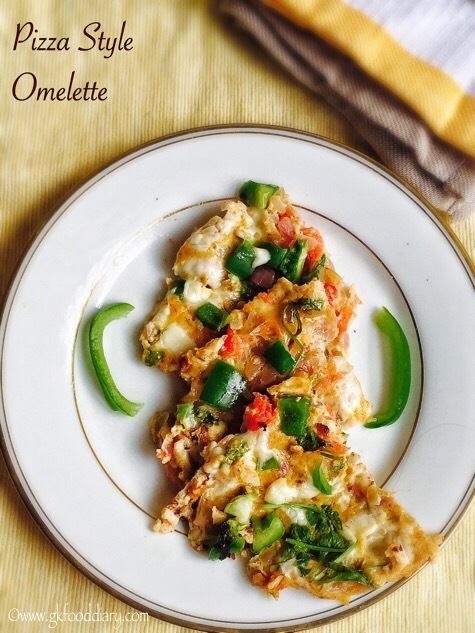 You could add any grated vegetables to this omelette to make it more healthy.